Sometimes, the easiest and simplest places make for great dishes. The O Mythos is located in Kifisia which is a residential area (where a friend of mine took me) and at first I was a bit skeptical given the place really looked simple to the max. However, I was hungry and they had a big offer on the menu for people forced to eat vegetarian dishes. 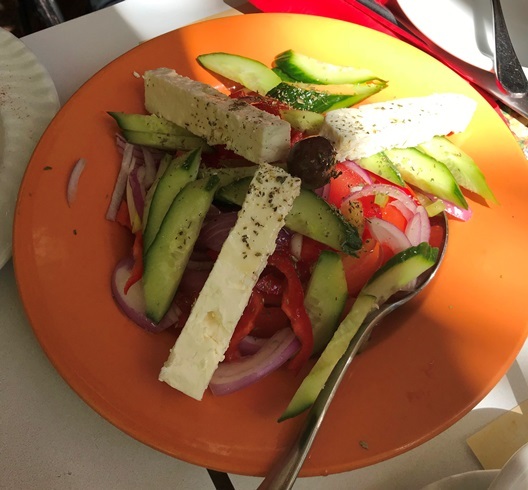 So I went for the “Greek Salad with feta” (EUR 5.50) which was delicious, especially because the tomatoes were so aromatic. 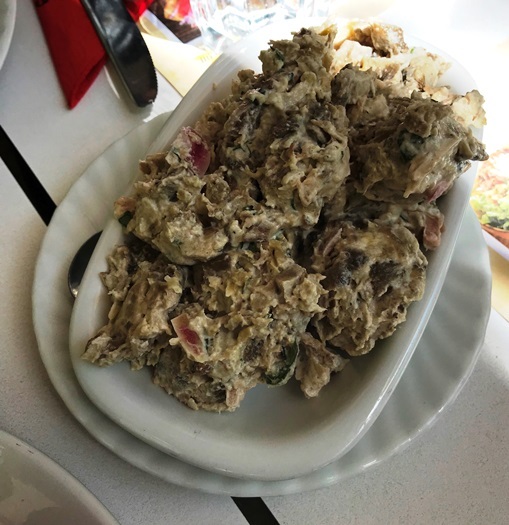 The “Eggplant Salad” (EUR 4.50) on the other hand was completely not to my liking. I don’t know why but it had somewhat of a charcoal flavor which didn’t quite do the trick for me. 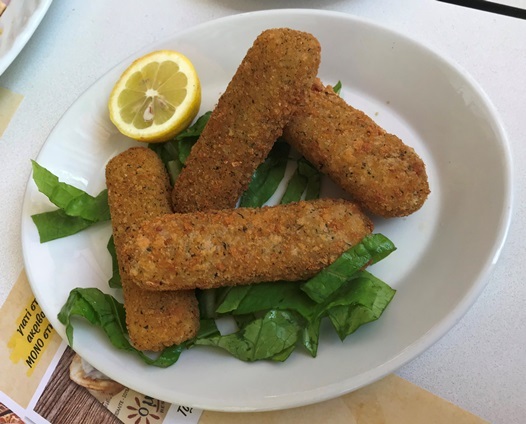 The “Mozzarella Sticks” (EUR 5.90) were, well, mozzarella sticks. Nothing spectacular but very cheesy (see what I did there? :-)). 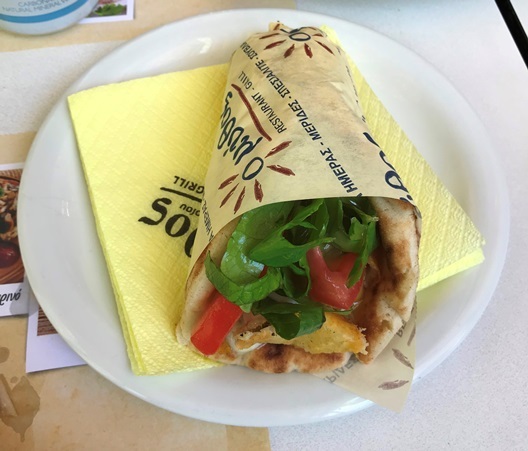 The “Haloumi cheese grilled on small pitas” (EUR 6.40) was great. A simple dish, but given the haloumi was not hard and dry as so often if you have haloumi in the Middle East (where I ate most of the haloumi I’ve had so far), but rather creamy, it was actually delicious. 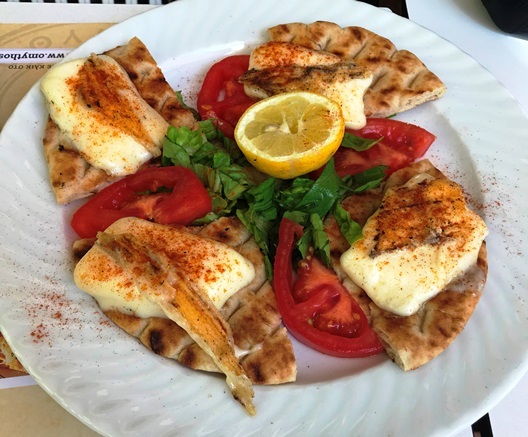 And the same was true for the “haloumi cheese stick souvlaki with pita bread” (EUR 3.10). Just delicious! I suppose, the perfect hangover food! What I loved about the place, despite its simplicity was the decor. 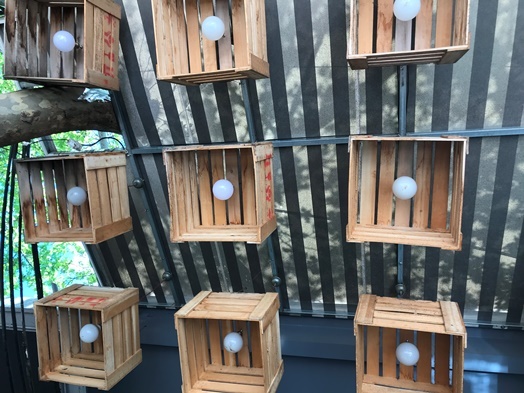 The lamps were just so cool! And the service does generally an efficient job. I mean, they are friendly but they definitely don’t overdo it – but you place your order, they disappear, your drinks come, they disappear, your food comes. You wave at three different people to ask for the bill and – eventually – someone decides to not ignore you and walks up to your table to bring the bill (and actually brings the CC machine right away). All in all, the O Mythos is not a place I would have voluntarily walked into but I must say it was worth experiencing as the dishes are good, the place is simple (not that appealing) but the service is swift and the prices are absolutely reasonable (also true for the beverages, i.e. 0,33l Sparkling Water for EUR 2.30).